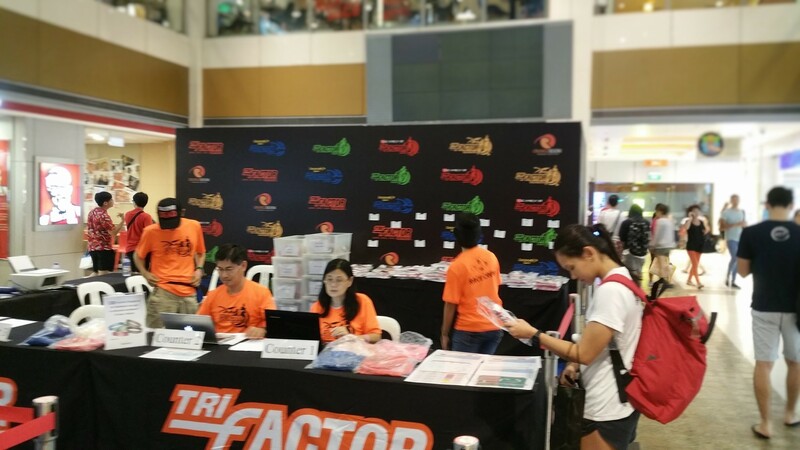 Race Review: Tri-Factor Series 2016 [RunSwim Challenge] (by KenJoe) | JustRunLah! So after recovering from the viral fever and missing out on the previous weekend’s (24th July) race (refer to my previous blog), I went on the next weekend’s Tri-Factor Series, RunSwim category, a new category created this year. It consisted of a 6 km run, followed by 500 m swim in the sea and another 6 km run. 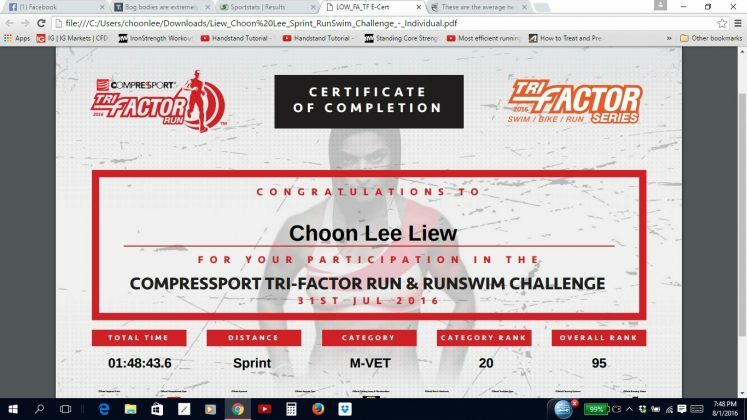 I signed up for this early this year, as I intended to get ready for my ‘initiation’ into a triathlon race in 2017/18. 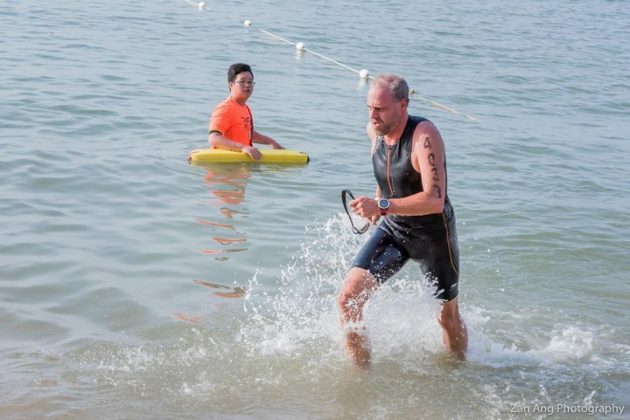 After all, I’m already 53 and starting to run at late 51, it didn’t seem like a good idea to rush into a triathlon race, so I thought I would start with longer distance aquathlons this year. But looking back, I had been in a hurry somewhat. After only 4 months of regular running, I went for my first half marathon race, then another half marathon 2 months after that, and then 3 months later my first full marathon. Since then, I had gone on to do fairly regular races at my own pace, and since I was a beginner, the fastest I did in those categories last year became my PB. 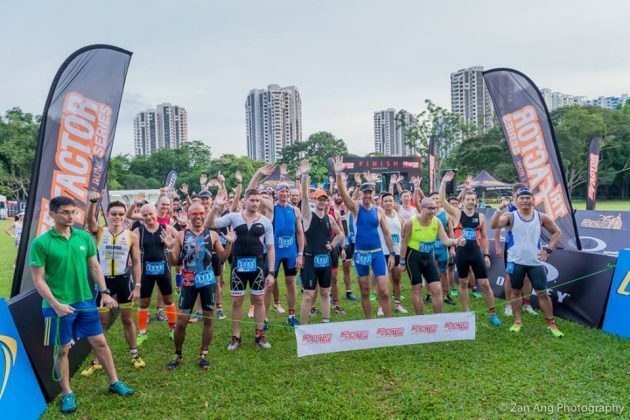 After completing 24 races last year, this would be my 17th competitive race for this year. Would have been 18th if not for running a fever over a duration of 4-5 days. 42 races in 19 months. So that weekend 24th, it was with a fever that I went to collect my race pack. 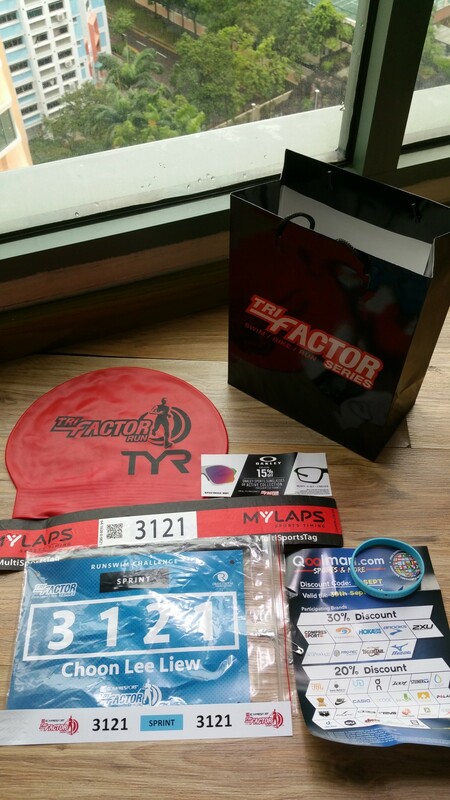 The swimming cap was red color this time vs the blue that I got from Blueseventy’s. The pack was ‘minimalist’ in my opinion. Anyway, I was not feeling too good so after collection, I tried to rest and will myself back to recovery. The doctor’s advice had been that if my fever didn’t go away by Monday, I would have to go back and test for dengue infection. I was quite sure it wasn’t dengue but that I had caught the virus from the hospital somehow the week earlier. Anyway, luckily, by Monday, my fever subsided, and there was just the cough and a bit of running nose. I was anxious to get ready so I went for a short 3.6 km run and then the next day, feeling better, I did another 7.1 km run, all at slower pace. Then I rested and got ready for race day. 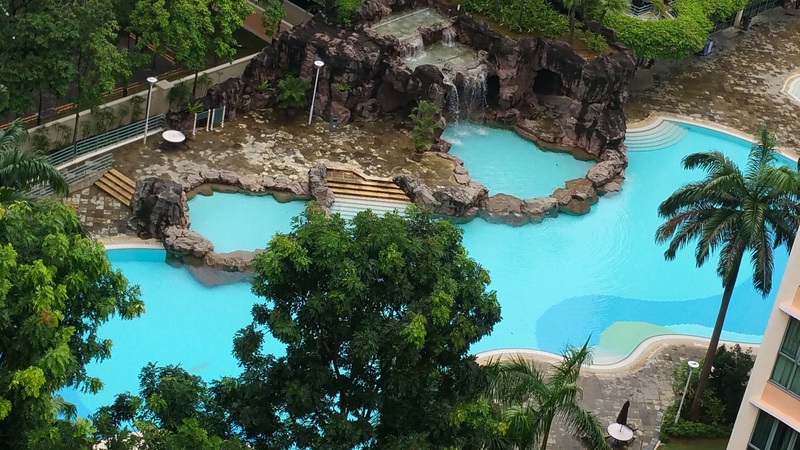 I also swam a short distance on one of the days in the small pool downstairs. 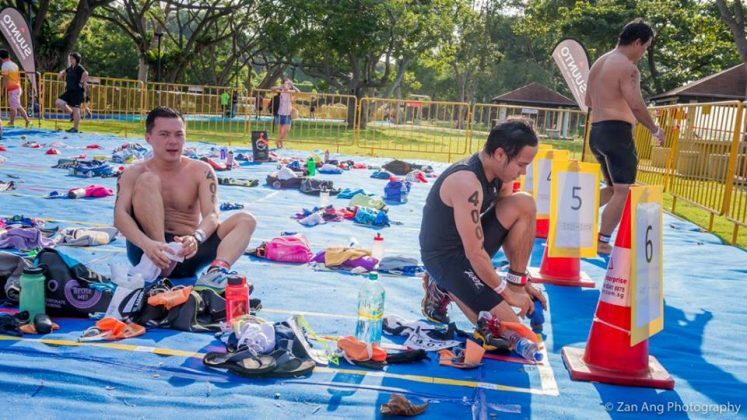 Race Day: I was as ready as I could get, given my ‘condition’ at that time. I drove to the venue early in the morning and parked at car park D1 which was free. This was a mistake as I realized later that I had to walk close to 2 km to the venue. I treated it as a somewhat longer than required warm-up. Still I was early and so on reaching, I queued up to get tattooed with the bib number. 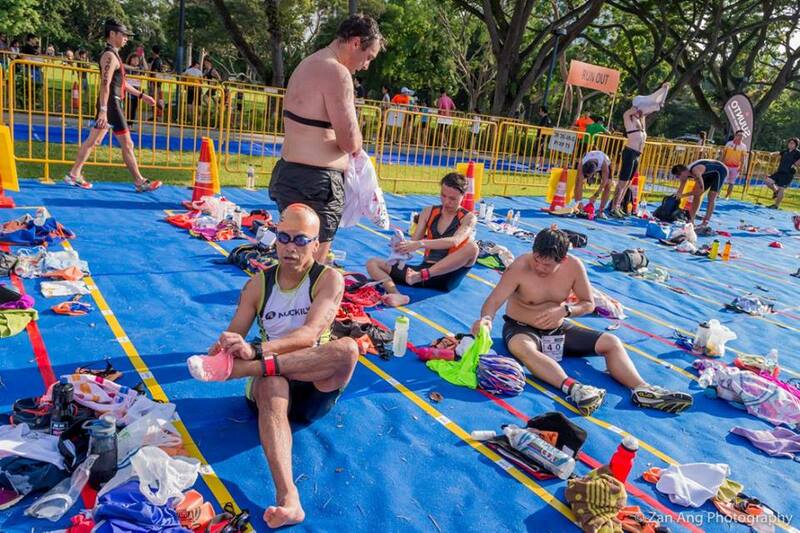 I then tied the ankle tag, placed my bag and laid out my swim cap, goggles, fresh pair of socks, towel in front of my bag, in the space allocated in the transition area. I stayed there for a while and then walked around. I came back to the transition area to check out again. I was getting ready to go, when the volunteer suddenly told me that I should put my bag with the baggage section. I thought of protesting because I saw that others had their bags with them. But I assumed she was going to tell the others as well, so I deposited my bag. Then I walked to the starting area. There, I realized I had left my energy gel in my bag. Well, I’ll have to do without the gel since I didn’t have adequate time to retrieve. I ran across the sand and went into the water. 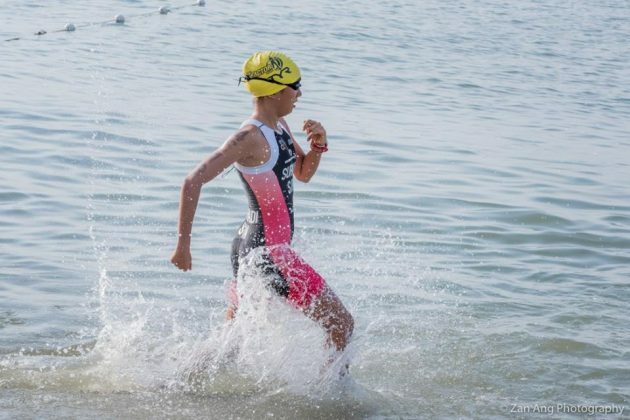 Wow, the moment I hit the water, I just loved the warmth and the near weightlessness – it was a nice switch from the pounding of feet earlier. I started to swim. I kept a fairly steady pace, though I was using breast stroke most of the times. I was enjoying the swim. The only unpleasantness might have been the mixture of seawater salty taste and the strong smell of petrol pollutants further out to the sea. The distance behind the swimmer in front was about constant though he was doing the free style. Stroke after stroke, I was feeling fairly comfortable and thought I could maintain my pace and maybe catch up. This was my second 500 metres in the sea (the first time in the sea was in the Nila Aquathlon). Thoughts about that first swim came floating back, and I felt surprisingly strong. Then I had to make the left turn. I had kept quite a distance from the border rope and noticed front swimmer getting into the border by mistake. Some folks on the boat nearby were shouting for him to get out. It was an inverted triangle to the shore, first 150 metres, then 200 metres horizontally and 150 metres back. I switched to free style now and then, just to get the feel and rest different muscles of my arms and legs. The 200 metres were a bit tougher because the sun was shining right into my eyes when I tried to look at where I was going. But it was still good, as I really enjoyed the near weightlessness of the water. 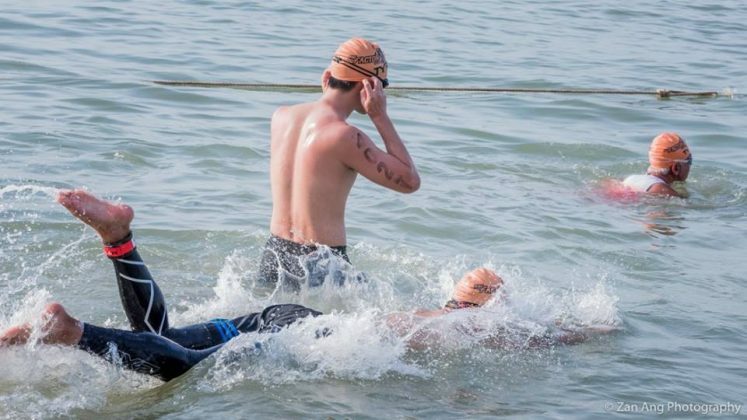 I tried to get nearer to the rope to reduce the distance I had to swim. Now the last 150 metres. I was still feeling comfortable though I felt some strain when I had switched to the free style. Then it happened. I felt a very sharp tight pull on my left calf muscles suddenly, cramping me up. I was still about 100 metres away. This was not good. I tried to calm down. My left leg couldn’t move. I digged harder with my arms and tried to get my right leg to kick harder. I struggled for a few minutes, swimming painfully and slowly. There were some shouts but I presumed they were not about me. Oh man, did I have to give up ? Surely, no. I would not do a DNF. DNS was already a bad experience. I will never give up ! I calmed myself, told myself to take deep breaths. I was going to finish this. And I think that moment, I got my ‘mojo’ back. Sometimes in your deepest struggle, you would find victory. I lost precious minutes but somehow the left leg then started to function again, though painfully slow. Kicked, breathed, swam. My legs touched sand. 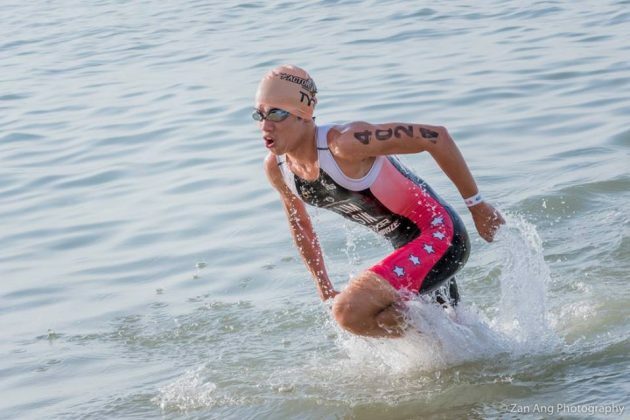 I stood up, walked up the shore and moved as fast as I could to the transition area, remembering to take off my goggles and cap. I wiped my feet, put on my fresh pair of socks and then struggled with the double knots of my left shoe for more than necessary, the darned knots refused to come out easily, I had pulled too tightly. The time splits later showed I took 2 minutes at this transition ! I then put on my running singlet and ran towards the exit and onto the last 6 km route. 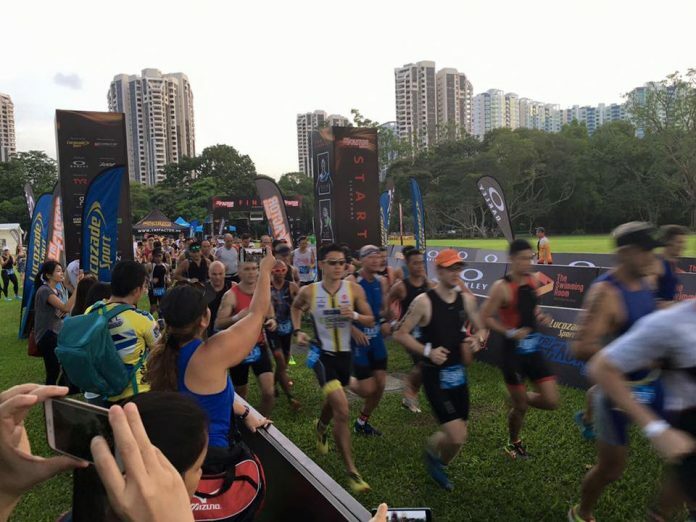 Luckily, somehow I managed to run still, felt a dull pain in the calf, but managed and completed the last 6 km which was in the opposite direction from the first route, towards Changi Airport. It was quite strange and miraculous that I still maintained a reasonable pace though this was slower than the first 6 km. This time too, I did stop to take the Lucozade offered. No gel but I felt almost alright still. Towards the end stretch, the kids’ race route overlapped with ours. I tried to run beside a fast running, very young kid. A man, presumably her father, was running and encouraging her. Not sure if she was getting tired or shy, but she slowed down a bit. I looked to the front and tried to overtake the runner in front, picking up pace a bit. At the finishing point we collected the Lucozade and finisher medal. A banana or two would have been nice, I thought. The medal looked simple in design. 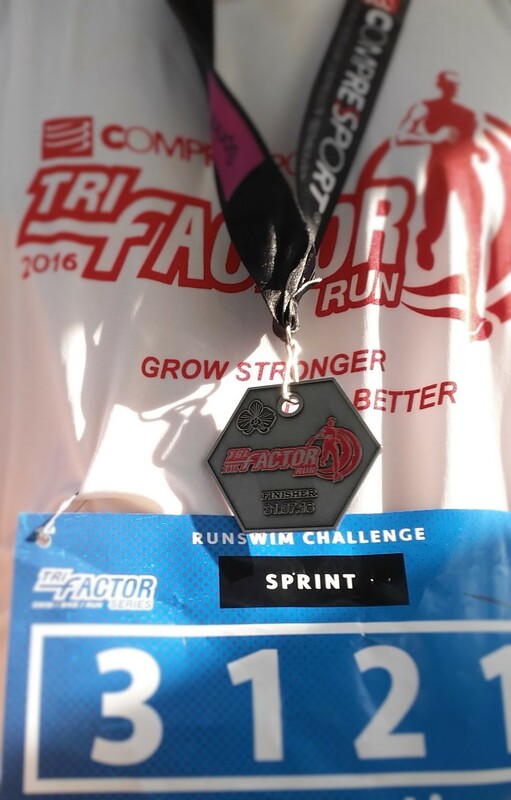 It just said ‘The Tri-Factor Run’, Finisher, 31.07.16 on one side. 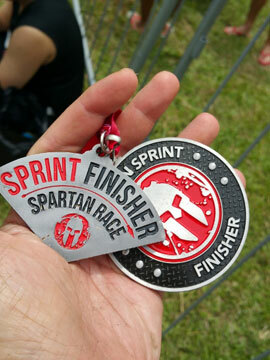 On the obverse side it said swim/bike/run series. Wished that it had been more specific for the category and with a swimmer/runner design somehow. Still, this would probably be one of my more valued challenge medals at this point. In life, knowing when is enough in that moment, is also critical. And what’s important is to carry on another day, push your limits and keep on challenging yourself. Don’t give up, pick yourself up after a fall. The day you give up, then probably that’s the end too. Nothing is impossible, but you have to pay the right price. 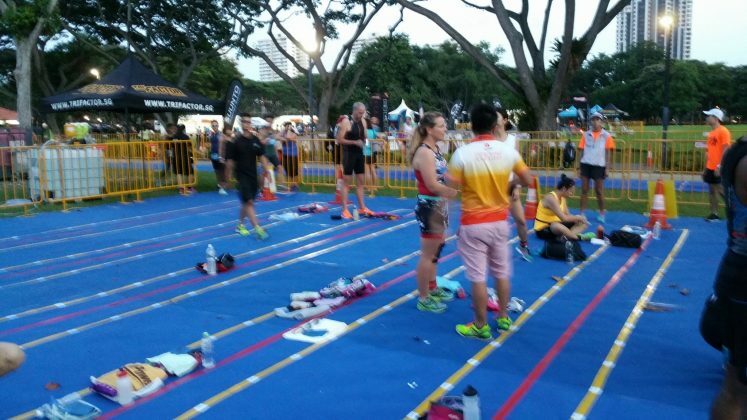 Final personal thoughts for that weekend : My first 12 km run plus 500 m swimming, longest aquathlon I did. So I have completed some of my bigger challenges this year, two half marathons within two Sundays, Spartan Super and this aquathlon. One is still out of my reach, sub-60 10 km race… but I’ll nail it, just haven’t paid my dues yet. 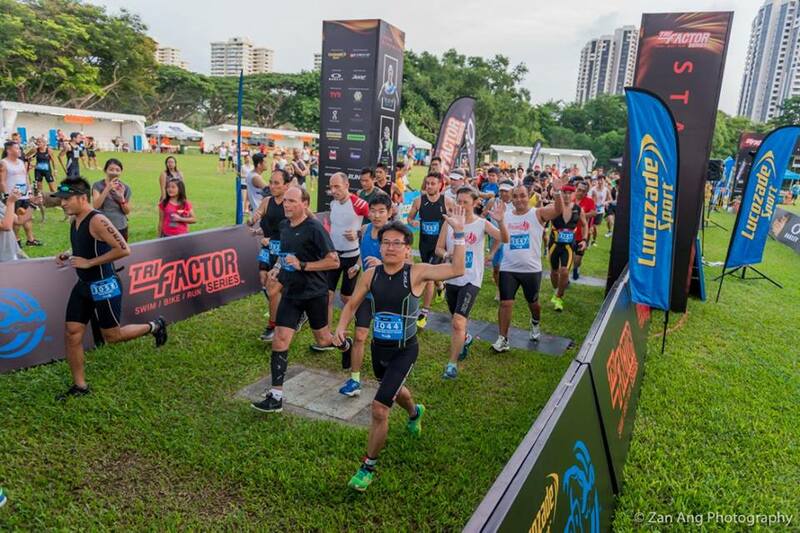 Performance Series III 10 km was on the week after, 7th August. Till then… happy running (and swimming) !